Vijay Antony shared the first look of the film on his twitter handle. The combo of Vijay Antony and Arjun Sarja is going to be one of the highlights of the film. 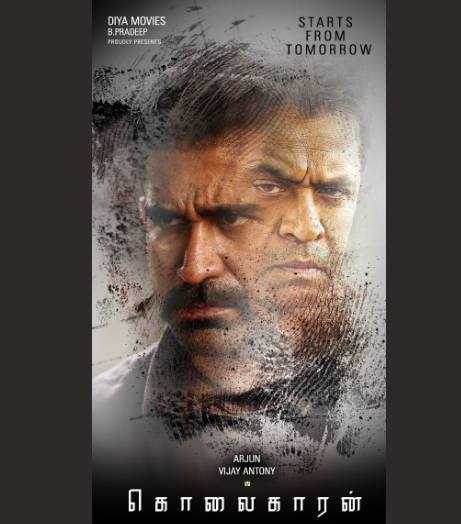 The first poster look of Vijay Antony and Arjun Sarja’s upcoming action film ‘Kolaigaran’ is out and it looks interesting. While the film is still in the pre-production stage, the makers of the film have unveiled the first poster, which is sure to leave fans excited. The team is currently finalising cast and crew and are soon to make an announcement on the same. The combo of Vijay Antony and Arjun Sarja is going to be one of the highlights of the film. The two are expected to create some magic on the big screens. How excited are you to see the two talented stars sharing the same screen space? The shooting of the film will go on floors this year. What do you have to about the poster? Share your views in the comments section below. Meanwhile, Vijay has currently geared up for ‘Thimiru Pudichavan’, directed by Ga eshaa. He will also be seen making a cameo appearance in the upcoming biopic ‘Traffic Ramasamy’. The actor has an interesting line up of films this year, let’s wait to know how Vijay manages to impress the audience. The actor was last seen in film Kasi. The movie simultaneously released in Tamil as Kaali. The film also saw actress Anjali playing one of the female lead opposite Vijay Antony starrer movie, directed by Kiruthiga Udhayanidhi. Vijay Antony’s Kasi received mixed reviews from the audience. Audience had quite high expectations from the film due to its publicity but it failed to live up to audience expectations. Before the release, on sharing her experience working with Vijay Antony, Anjali said, “I must say that Vijay Antony has a huge variation when the camera lens is off and on. He is completely calm and much reserved, but he transformed into a powerhouse when camera is switched on. I am playing his partner in episodes that is set against the modern backdrops. My role in this film is sketched with humour and jovialness, which I believe audiences will enjoy and accept.